The 5 Day Miracle Diet is a diet based on consuming reduced calories 5 days of each week and moderate calories on 2 days of each week. Most people choose to practice the 5 day diet Monday through Friday and take Saturday and Sunday off. This type of diet can be successful for those that don’t do well on overly restrictive diets and who still want to enjoy occasional treats and going out to eat on the weekends. The 3 Day Diet and The 7 Day Diet are other options and there’s also a specific 5 Day Blood Sugar Diet available. The guidelines of the 5 day diet are pretty simple, but basically revolve around a few must follow rules. Dieters should follow a reduced calorie diet with no fewer than 1200 calories for females and 1500 calories for males. A good calories for weight loss calculator can help dieters set appropriate daily calorie amounts. No refined sugars or carbs. Lean meats and healthy oils only. During the weekends there are no forbidden foods and calories can be increased, but, within reason. Dieters shouldn’t exceed their weight maintenance calorie levels. Dieters should enjoy their favorite foods on the weekends BUT still practice portion control as well as discretion when eating out. 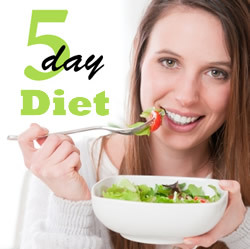 One of the benefits of the 5 day diet is that it keeps your metabolism guessing, which is believed to prevent plateaus and prevent your body from going into starvation mode. By increasing your calories 2 days a week, your body doesn’t adapt to the reduced number of calories consumed 5 days a week. The 5 Day Miracle Diet recommends moderate exercise 5 days a week. Walking, biking, strength training, weight training, jogging, and swimming are all great ways to burn calories and get fit. Just be sure the exercise doesn’t put you below your minimum calorie amounts for each of the 5 days. Limits refined carbohydrates and sugars. Addresses some psychological factors involved in overeating. Eating breakfast is associated with improved weight management. The 5 day diet can be adjusted to suit vegetarians and those with insulin resistance and carbohydrate addiction. Helps those that struggle with deprivation. Reduces processed foods in the diet. Restrictive during 5 days a week. Some may struggle with eating too many calories on the weekends. Some may struggle with calorie counting and meal planning. The 5 Day Miracle Diet program is not actually a five-day diet but rather five days is the amount of time it takes in order to stabilize your blood sugar. Puhn explains in detail exactly what foods you should be eating and at what times. The diet involves three main meals as well as three or four small snacks daily. There are strict rules regarding the timing of meals. Breakfast should be eaten within thirty minutes of getting out of bed. You must eat snacks as often as required between meals so that you never go more than three hours without eating. Breakfast consists of a combination of protein and complex carbohydrate while lunch and dinner includes protein and vegetables. Between meal snacks are low glycemic index fruits and vegetables such as apple, celery and melon. Dieters are advised to avoid certain foods that have a high glycemic index such as yogurt, bananas, grapes and bagels. All of the rules of the Blood Sugar Regulating Diet must be followed exactly otherwise you will need to start the program from the beginning. Once you have stabilized on the plan occasional indulges are permitted. 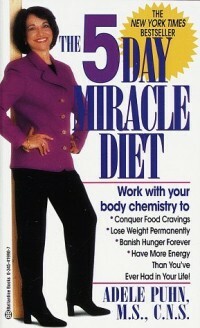 The 5-Day Miracle Diet retails at $17.45. I was on this wonderful program 2012-2015. Did well for me. I was able to fit into 14-16 after 25 plus yrs. here is all the benefits I experienced: woke up every morning 9 am no later unless I wanted and no earlier than 7, memory was coming back slowly, my speech and concentration was getting better, I felt good about myself, I could walk for miles to workout and not get tired, go to bed at 12 or 1 am and still pop up like toast at 8 or 9. My hair was growing and I was happy happy. 2015 I got pregnant again and I was craving many things, I sleptes a lot cause I was always sleepy! Gained over 40 lbs and now I’m still trying to get back on track after losing my pregnancy due to eating to much crab, and shrimp which I craved every week and I got it too. Then I would bleed real bad black blood and chunks would fall out. Well you know what happened. My pregnancy was self terminated. Cravings went away, breast swelling and tenderness disappeared, cramps left and I stopped bleeding in 4 days. Now I want to take off the weight and go back to 180. Plan to get pregnant again soon and my hips already out enough! I will get Mommies hips again. I a good and health pregnancies!!!! The program works that for sure. You meal seems to be for white foreigners only. What of African food. Garri and soup, local dishes etc?